The effective coordination of rescue assets, teams, and procedures are necessary to ensure the best outcomes for crews and survivors alike. Learn why speed matters, why equipment standardization is important, and how the safest operations manage the risk. In many cases the need for definitive medical care for survivors of offshore emergencies requires the use of helicopters to transfer victims from rescue vessels to hospitals or waiting ambulances ashore. This transfer from vessel to aircraft, while underway, if often the most hazardous operation in the chain of rescue from offshore to advanced care. Vessel crews should be familiar with not only the tactics and procedures of local helicopter assets, but with the equipment used by aircrews and their communications practices as well. The effective coordination of rescue assets, teams, and procedures are necessary to ensure the best outcomes for crews and survivors alike. Learn why speed matters, why equipment standardization is important, and how the safest operations manage the risk. 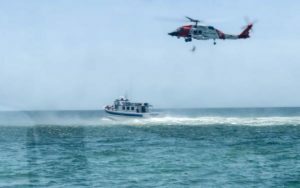 Former USCG helicopter rescue swimmer Mario Vittone discusses the lessons learned by the U.S. Coast Guard and by helicopter operators around the world while transferring victims from vessels to aircraft and what your teams can do to better prepare for at-sea transfers to helicopters.